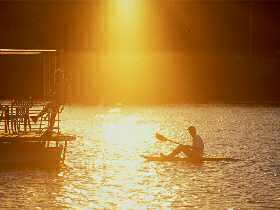 The many rivers and dams in the region, along with some of the best beaches in Australia, provide numerous opportunities for canoeing, kayaking and water based recreation. For those who want to be active, "paddle power" gives you the opportunity to enjoy a more serene way to get about, and get closer to local wildlife, while day cruise operators will show you the estuaries, canals and riverfront from the comfort of a cruise boat, with charter fishing operators taking you into open waters offshore. Tariff is indicative only. Find out about the World Heritage of the region. When visiting our natural and scenic attractions please observe the Guidelines for Ecotourists. Book* selected tours and activities below or search wotif.com for more options. Take to the waters of Byron Bay to mingle with some friendly dolphins at the edge of the Coral Sea on this incredible kayaking excursion. The colourful marine life and the spectacular sights along the coast give you a great way to explore around the easternmost point in Australia. Half-Day Gold Coast Kayak, Snorkel & Hand Fish Feeding. Paddle across the short passage of the Gold Coast's Broadwater estuary and explore the beautiful white sandy beaches of South Stradbroke Island. Visit secluded areas, snorkel with tropical fish and spot dolphins and whales on this half-day kayak trip. Twilight Kayak Tour. Family/group tickets available. Enjoy the rejuvenating peace in this secluded area, away from the usual crowds of surfers and beachgoers, as you paddle along the Nerang River and canels in the centre of Surfers Paradise, amidst a spectacle of light and colours refracted off the glistening calm of the water. 2-Day Sailing & Camping Tour on the Gold Coast. Spend 2 days immersed in the natural beauty of the Moreton Bay Marine Park as you learn to sail an easy-to-manoeuvre trimaran kayak. Watch for marine life like dolphins as you sail along, gather around the camp fire for a delicious barbecue dinner, and spend the night under the stars at a campsite on South Stradbroke Island. Try out one of Australia's best seafood and adventure experiences with Catch a Crab. Join this special experience for some fun activities that give you a sense of the unique outdoor lifestyle Down Under. Wotif, Wotif.com and the Wotif logo are either registered trademarks or trademarks of Expedia, Inc. in Australia and/or other countries. All other trademarks are the property of their respective owners.